This past week was amazing! On our way to the Island we were able to stop over in Atlanta to see Doug participate in the inaugural Olmsted Plein Air Invitational. Springtime in Atlanta was not a bad thing! In fact, the Invitational started with the artists assembling on Earth Day and Sunday would have been the Linear Park's Frederick Law Olmsted's 193rd birthday. This celebration of Art in Nature seems to be an appropriate way to celebrate these events. The parks are actually a string of six parks. 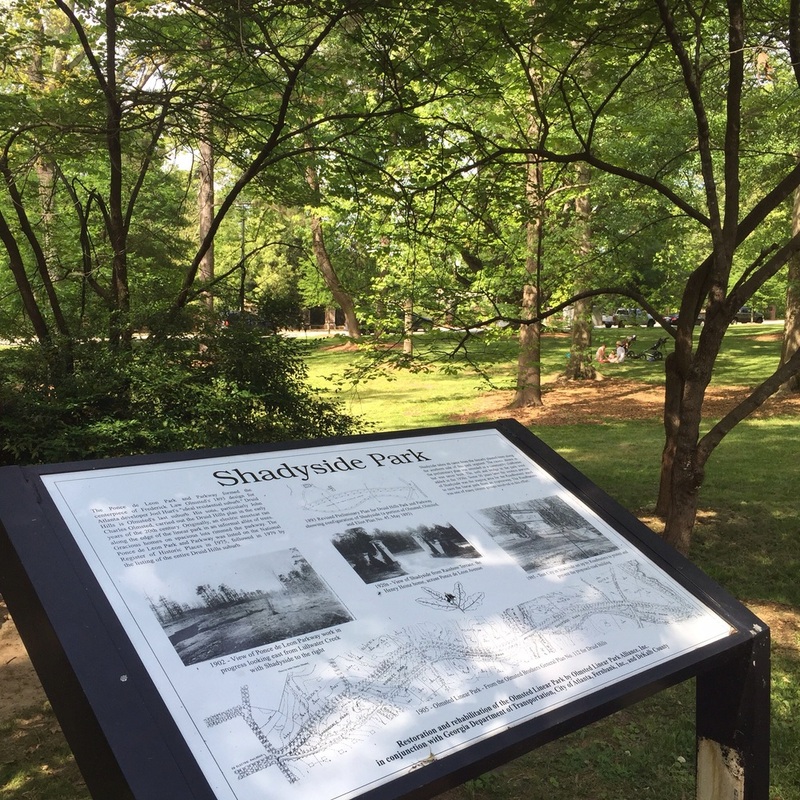 Shadyside Park is an example of the structure and environment where this event was set. 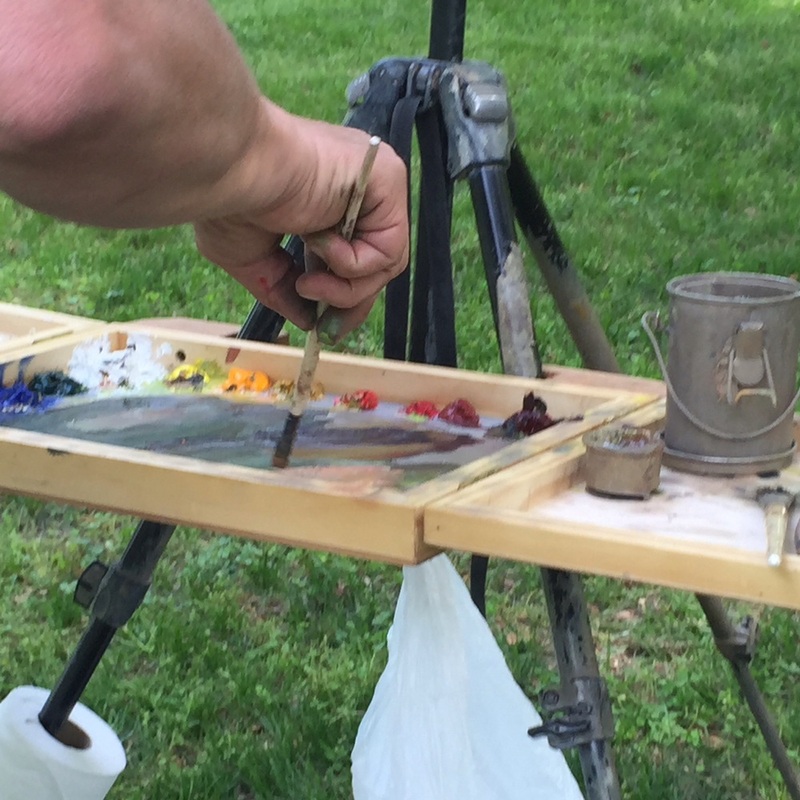 The Olmsted Plein Air celebrates the work of the recently completed restoration and will aid in supporting the continued maintenance of these urban parks. Thirty artists were invited to attend the intense four day event. (I'm tired and all I did was attend.) Work was created throughout the 2+ mile length of the parks. 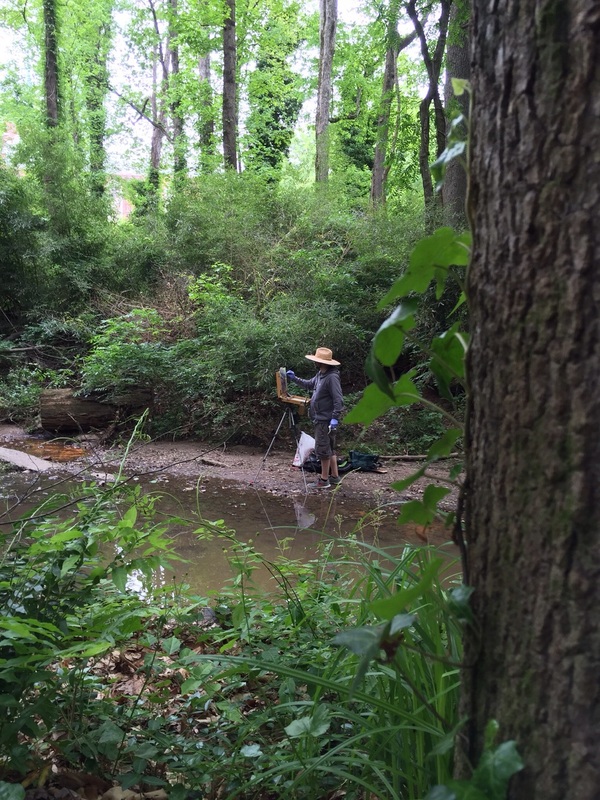 After a search Thursday morning, Doug had settled on a creek he found in a ravine in Deepdene Park. Leave it to a Clarke to find a water feature on that first day. My thanks to the Eagle Scout who had just finished a trail down to that spot! The need for figures and focal points were solved with among other things, vintage cars. So Lew was kept busy inspecting although Doug had other things in mind to paint. Wherever/Whenever Doug paints, nocturne comes into play. He has always been a night owl and the weather has never bothered him. So, it was natural to seek out a legendary 24 hour establishment on the edge of the boundary. The rules said the scene had to be able to be viewed from within the boundaries. It was Doug's kind of thing...the lights would stay on and there was always coffee. I think Doug was honored to be in such good company...and he sold some work, too. 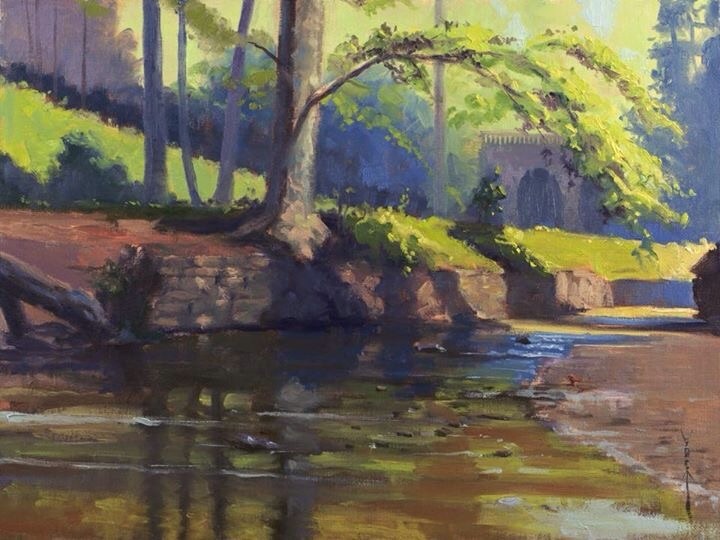 The days were packed but the chance to paint with and learn from this company was valuable. It was a chance to make new contacts and renew old acquaintances. The last event, the Paint Quick, drew painters from around the area increasing the group to about 100 on Sunday. Participants had about two hours to paint. The invitational division was encouraged to paint in the central Artists Village and Doug found a willing model. Tatiana was lovely, cooperative and patient! Hopefully, traffic improved for their business! I think Lew had a good time...I know I did. We were fortunate to share this time with Douglas. 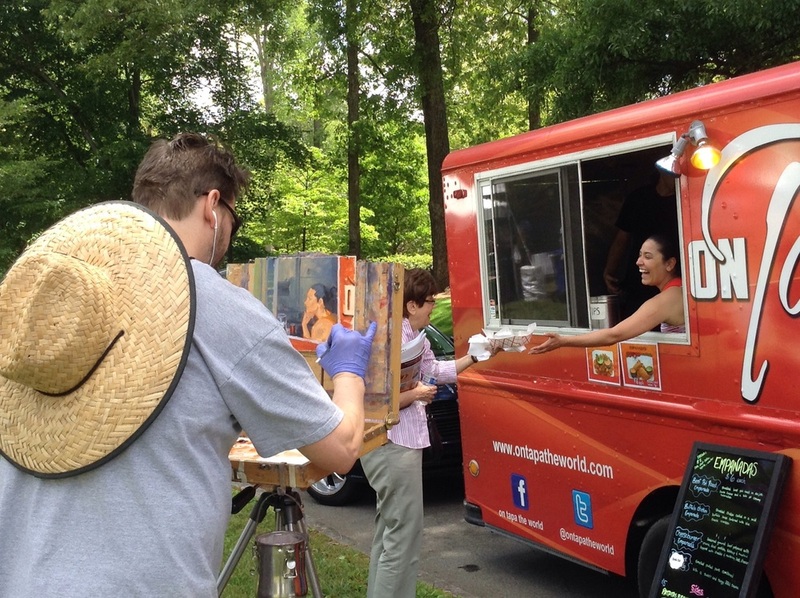 The weather cooperated and the warmth of this creative group was something to treasure. Olmsted would be please to see his vision complete and functioning in this way.